We all know how much time and preparation goes into a Thanksgiving meal. 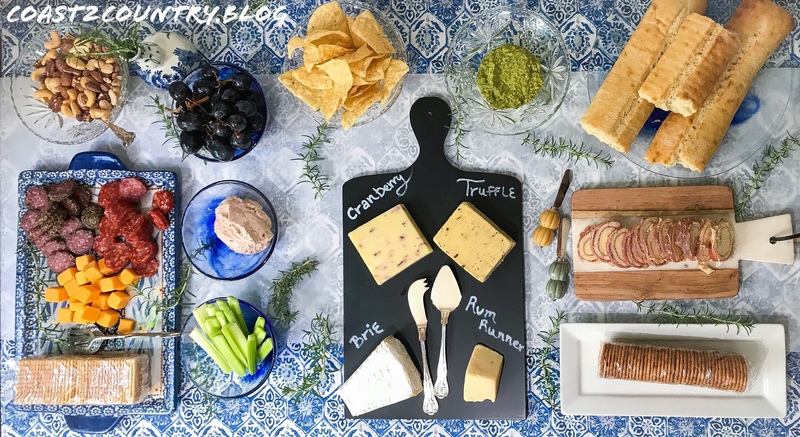 While your guests wait keep them occupied and satisfied by creating a fall themed snack table! Forget planning thanksgiving lunch, let them snack instead! There are so many tasty seasonal cheeses! I found cranberry cheddar, truffle & rum runner. Pesto sauce and baguettes add a hearty touch. Fill the table with hard salami, nuts, veggies, fruit and seasonal dips like this one – cranberry chipotle dip! lastly I love my rosemary shrub because it stays green all winter and you can cut sprigs as fragrant table scatter. Remind your guests not to fill up before dinner!